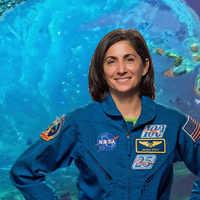 Nicole Stott is an astronaut, aquanaut, and artist who believes that sharing the orbital and inner space perspectives has the power to increase everyone’s appreciation of and obligation to care for our home planet and each other. A veteran NASA Astronaut, Nicole’s experience includes two spaceflights and 104 days living and working in space on both the Space Shuttle and the International Space Station (ISS). She performed one spacewalk; she was the first person to fly the robotic arm to capture the free flying HTV cargo vehicle; she was the last crew member to fly to and from their ISS mission on a Space Shuttle; and she was a member of the crew of the final flight of the Space Shuttle Discovery, STS-133. A personal highlight of Nicole’s spaceflight was painting the first watercolor in space. Nicole is also a NASA Aquanaut, who — in preparation for spaceflight and along with her NEEMO9 crew — lived and worked during an 18-day, and longest saturation mission to date, on the Aquarius undersea habitat. As an artist, and now retired from NASA, Nicole combines her artwork and spaceflight experience to inspire creative thinking about solutions to our planetary challenges, to raise awareness of the surprising interplay between science and art, and to promote the amazing work being done every day in space to improve life right here on Earth. Nicole is featured in National Geographic’s One Strange Rock (2018), a documentary series hosted by Will Smith and directed by Darren Aronofsky. She can also be seen in Arrow Media’s Man-Made Planet and Planetary Collective’s Overview.